Alhambra, CA - His Grace Bishop Maxim of Western America celebrated this Krsna Slava, Lazarus Saturday, on Saturday, April 27, 2013. Bishop Maxim officiated at the Holy Hierarchical Divine Liturgy. Concelebrating with the bishop were the clergy of the St. Stevan's Cathedral. There were a few hundred Orthodox faithful in attendance. 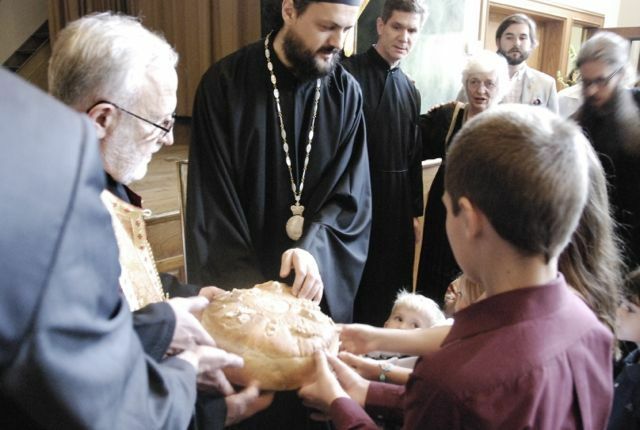 The rite of the Cutting of the Slava Kolac was served in the hall after which an agape meal was served, prepared by the Diocesan Kolo Sestara. A large number of clergy attended the Slava.